Some came looking for inspiration and encouragement. Others sought guidance in moving to the next phase of their young careers. All welcomed the camaraderie of like-minded colleagues in a very competitive field with multiple subdisciplines. 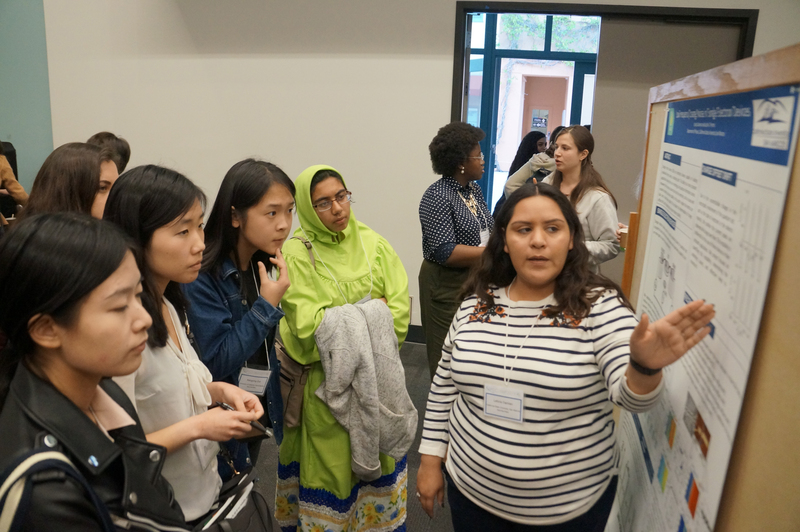 So it was that a couple hundred members of the next wave of North America’s female physicists converged at UC Santa Barbara, one of 12 university campuses selected to hold the American Physical Society’s (APS) 2019 Conferences for Undergraduate Women in Physics (CUWiP). “This conference provides a great opportunity for young women in physics to go and meet fellow women undergraduates from other universities, faculty, postdocs and graduate students,” said Sathya Guruswamy, a faculty member in the physics department and the College of Creative Studies, as well as one of the two co-chairs of the event’s local organizing committee. The conference offered networking opportunities as well as panel discussions relevant to participants’ experiences as women in a competitive and historically male-dominated field, she said. The event had strong support from the Department of Physics, with opening remarks presented by department chair Claudio Campagnari and by Nobel Laureate and APS president David Gross, a professor of physics and a permanent member of the Kavli Institute for Theoretical Physics. Welcoming remarks at the conference banquet were made by Chancellor Henry T. Yang, Executive Vice Chancellor David Marshall and Vice Chancellor for Research Joe Incandela. Undergraduate students from local and regional colleges and universities filled Corwin Pavilion and meeting rooms at the University Center to hear speakers discuss the particulars of research, give advice on pursuing advanced degrees, troubleshoot gender-based biases and recommend ways to maintain a work-life balance. “One thing that we strove to do was to emphasize careers that are not just those in academia,” said UC Santa Barbara physics graduate researcher Chantal Nguyen, one of several organizers of the event. The roughly 18-month preparation for this conference resulted in sessions that highlighted physics careers in national laboratories and in industry, as well as in fields such as medicine or computer science, which require and benefit from people with strong physics backgrounds. The event was designed to give attendees an opportunity to meet with and hear from potential colleagues and mentors, she said, and help undergraduate students refine their goals, or explore new avenues of research and learning. One such role model was Fabiola Gianotti, particle physicist at the European Organization for Nuclear Research (CERN), and its first female director-general. 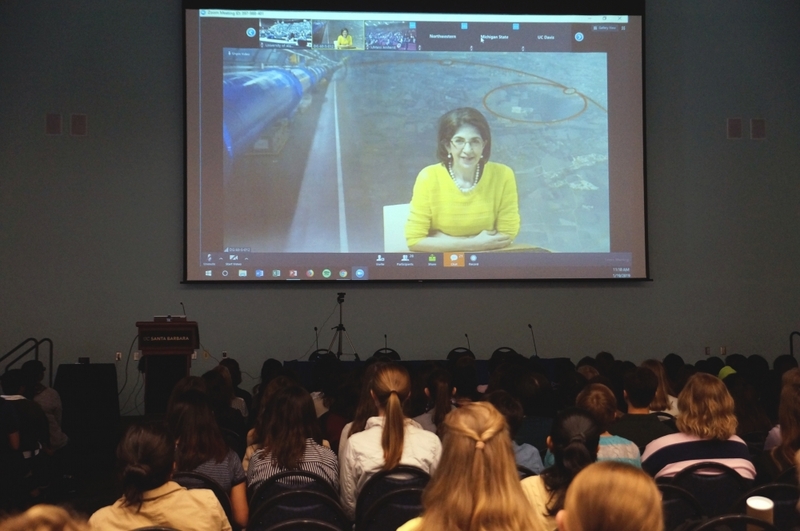 “I’m very pleased to have the opportunity to speak at such a nice and valuable conference,” said Gianotti, speaking via a remote link from CERN headquarters in Geneva, Switzerland, to all 12 campuses participating in the CUWiP. Gianotti’s road to physics prominence began in an unlikely place for a future scientist — the arts and humanities, which she pursued in her earliest education. However, a biography of Marie Curie — the renowned French physicist, chemist and first woman to win a Nobel Prize — so deeply impressed Gianotti that she changed course and embarked on a career in physics, ultimately working on several CERN experiments. Gianotti’s efforts have resulted in, among other things, leadership of the ATLAS experiment, one of two groups that reported the discovery of the Higgs Boson in 2012 (the other group reporting their results, CMS, includes members of the UCSB High Energy Physics Group and their students). Over the course of her career, Gianotti has received numerous honors and recognitions for her work, and has seen the number of women joining the field increase. “We pursue a lot of opportunities at CERN to promote women in science,” she said. To boost women in physics, the CUWiP recognizes the need to start early in their careers. For the UCSB conference that meant 15 student talks geared specifically to presenting and discussing undergraduate research. Other panel discussions and breakout sessions dealt with topics of diversity and sexual discrimination, LGBTQ issues in the science, technology, engineering and mathematics (STEM) fields, impostor syndrome and stereotype threat. Event co-chair and UC Santa Barbara physics graduate student Shankari Rajagopal believes an event like CUWiP can help. “When you’re at a conference like this, where you’re among so many other women scientists, you stop seeing yourself and them as women scientists, and just see each other as scientists,” she said. For many of the attendees, the conference was an essential part of the road to their futures. While it gave some their first glimpse into the landscape of physics, others were repeat attendees, checking in as they pursue their degrees. “I really like the conferences; I think they are inspiring,” said Hannah Reutershan, a physics major from California State Polytechnic University, Pomona, who attended the event. Now on the cusp of graduating with her bachelors degree, she’s ready to hone in on a more specific field of study — astrophysics. “This time I came for information on grad school,” she said. 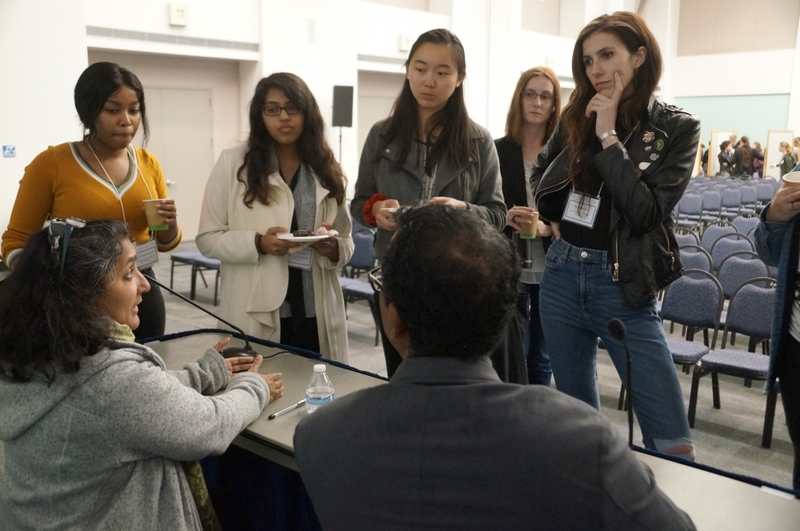 Reutershan’s colleague and fellow Cal Poly Pomona student Yara Maayah felt the same way about how the conference makes the idea of a physics career less nebulous, and less overwhelming.